Automatically Adjusts to Line Speed Changes with Constant Tension for Self Tending Operation. Adjustable Tension Accomodates a Wide Range of Web Materials. Operates on 120VAC, Single Phase for Simple Installation. Standard and Custom Configurations Available. Versatile Machine Handles a Broad Range of Web Materials. The TW3 Series Trim Winder provides a convenient means to wind narrow webs into neat, easily handled packages. The web is wound onto inexpensive cardboard cores which are placed on a supplied mandrel. The core and mandrel are driven by contact with a 6-inch diameter roll, which is covered with a cork/rubber composition friction material. Precision Transversing Mechanism Provides Reliable and Consistent Performance. The web is spooled into a package that is 18 inches in diameter by 18 inches long by an oscillating guide ring with an inside diameter of 1½ inches. The oscillating guide ring is driven by a protected ball reverser with hardened steel components. The principal is the same as a level wind fishing reel. Robust Design and Quality Manufacturing for Dependable Service. The drive roll and oscillating guide ring are driven by a direct current motor. Industrial ball bearings are used throughout. The drive is controlled by a unique electronic controller with a potentiometer to adjust tension from 0-5 pounds of force. In operation, the unit is threaded-up, the tension is dialed in, and turned on. The winder then follows the slitter or other upstream device, increasing or decreasing speed as required without constant attention. When the slitter stops, the winder stops, maintaining tension until motion resumes. The standard winder can operate at speeds up to 500 ft/min. and high speed versions can operate at speeds up to 1500 ft/min. 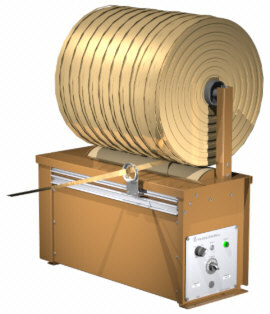 Rugged Level Wind Machine is an Inexpensive Solution for Collecting Paper, Film & Foil Edge Trim Waste.